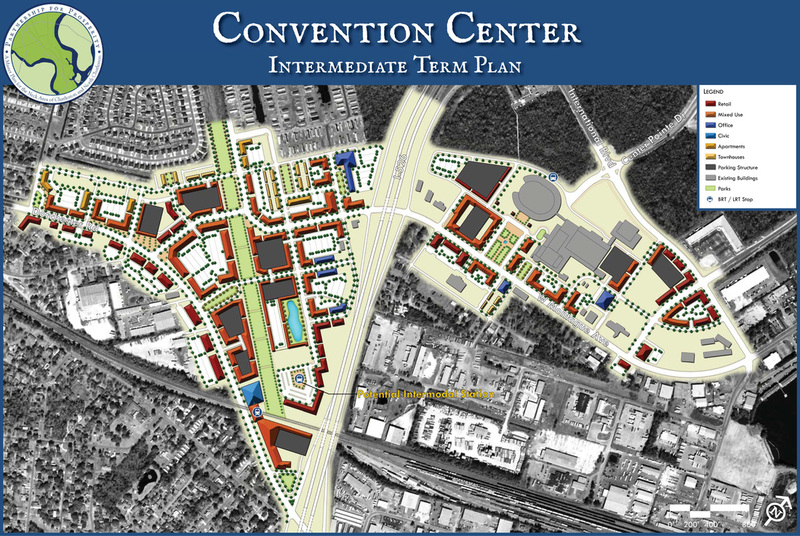 The Convention Center catalyst area is planned to function as a regional gateway. I-526 bisects this land and connects with I-26 about one mile to the east. With three exits from I-526 and one exit from I-26 providing direct access to major area roadways, this gateway district is easily accessible from all parts of greater Charleston as well as regional destinations. The Charleston International Airport and Boeing manufacturing plant are located directly to the north and west and are major economic drivers that influence this catalyst area. 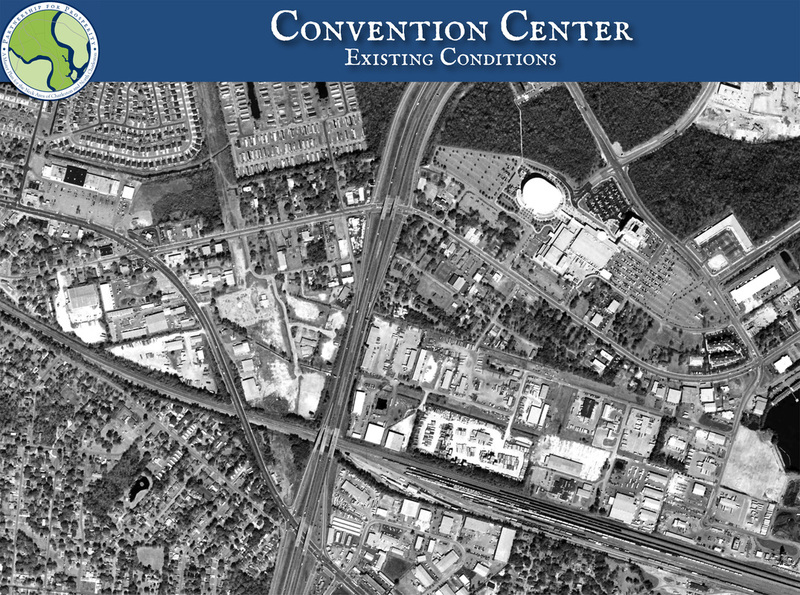 The North Charleston Coliseum, Performing Arts Center, Charleston Area Convention Center, and surrounding hotels and commercial form a campus-style core in the western portion of the area that serves as a regional draw. The proposed Intermodal Station, under early stages of infrastructure development, is located in the eastern portion of the area, accessible by both road and rail. The catalyst opportunity that will help start development and redevelopment in this area is construction of the Intermodal Station. 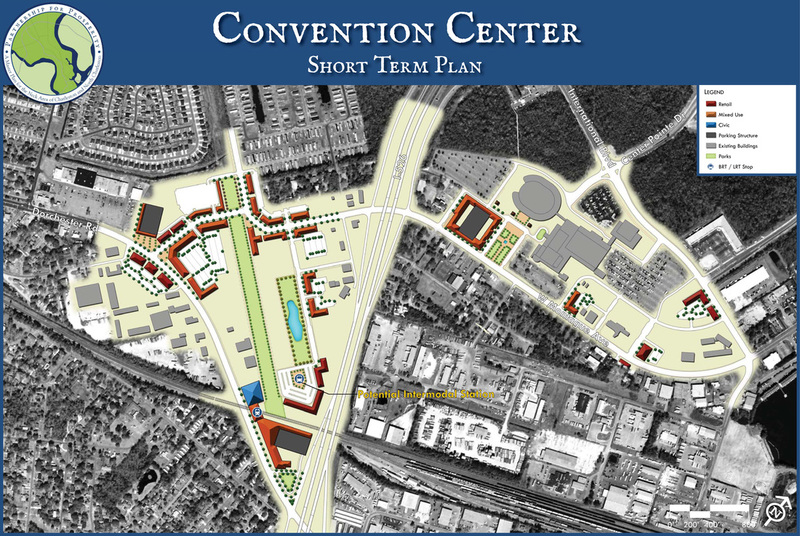 The completion of this facility will not only bring a variety of users to this area, both those commuting locally and those coming in from all points via express bus service on Dorchester Road and I-26, Amtrak, Greyhound, or the Charleston International Airport, but adjacent properties will likely develop in response to the assortment of amenities and retail services associated with these users. This project sets the tone for the entire catalyst area and begins the transformation to a mixed use regional gateway. There has been some discussion about moving the Intermodal Station from this location to the Amtrak Station catalyst area. In the event this happens, the Intermodal Station site can be used as an employment core without changing the basic configuration and phasing concepts shown for this catalyst area. Building sizes in the western portion of the catalyst area (west of I-526) are envisioned as low-rise (1-3 stories) that transition into existing neighborhoods, with mid-rise buildings (3-5 stories) around the Intermodal Station core area. 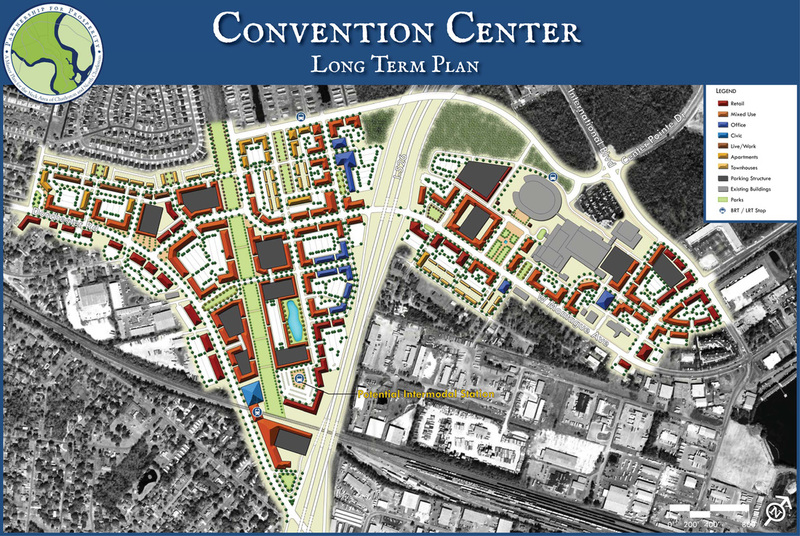 In the eastern portion of the catalyst area (east of I-526), buildings are envisioned as mid-rise (3-7 stories), complementing the mass and height of the Coliseum complex. This portion of the catalyst area will benefit from connectivity to the Mall Drive area via a new circulator shuttle bus system along the extended Centre Pointe Drive across I-26 to Mall Drive. This will link the Intermodal Station area to the regional accessibility provided by the new commuter rail and BRT/LRT transit systems running along the Neck’s multimodal spine. The preliminary planning level program derived from the Long Term Phasing Concept Plan shows that about 450 residential dwelling units and 2,000,000 square feet of non-residential uses could be developed in this catalyst area.